Ships Log MTB 07 "11.17 secured on fuel lighter. Five bombs dropped on graveyard on opposite bank. 12.09 secured on (HMS) 'Aldgate'. Several serious raids during day on dockyard (27 planes at a time) '08' burnt out. Lt Kilbee HKRNVR "Worst day of the battle for me and my crew. 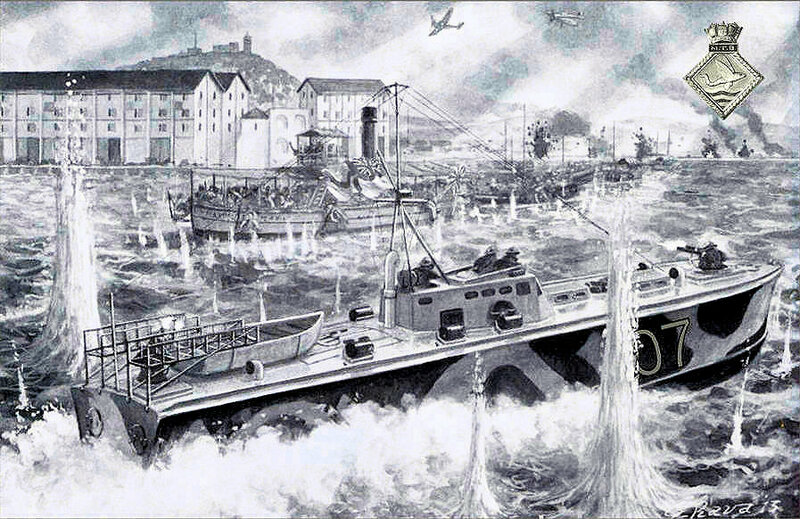 Having been hoisted onto the slip during the night, biggest air raid on Aberdeen dock this morning, enemy after Thracian. About noon large formation of planes dropped bombs from high level; the target was Thracian our biggest warship. The SOE team were being shown over the ML French in Aberdeen dockyard by Lt J B Colls. Their task was to supply Chinese guerillas with small arms. Lt-Cmd Gandy RN (Rtrd) "About 08.30 I received an urgent telephone call from XDO to V2 (me) in "Robin" to send one sub-division into Hong Kong harbour to Lewis-gun Japanese crossing from Kowloon Bay towards Taikoo in boats and ferries; another sub-division to standby for orders at Green Island, with remainder to await orders at Aberdeen. MTB's 07 and 09 were fresh, having had the night off, and were selected for the first sub-division. All boats ordered alongside "Robin" to prepare ammunition etc. MTB 10 with V2 aboard had to swap with MTB 11 for the second sub-division, and 10 remained alongside "Robin." The 238th Regiment of the IJA sent 8 craft with outboard motors towing collapsible craft with with troops lying unmoving in the bottom. They were accompanied by one group of 3 Shohatsu and two groups each consisting of 5 local power craft - probably cross harbour ferries that had been coomandeered..
MTB 07 attacked at full power with with 09 one cable (200 yards) astern. The enemy were taken by surprise and did not fire on the two MTB's until they neared North Point where they came under withering fire from land, sea and air, suffering heavy losses in the process. Opening fire at half a cable from the enemy craft with both pairs of Lewis guns plus a stripped Lewis in the hands of the 1st Officer on the bridge Ashby ran parallel at five yards to the enemy craft giving the gunners free range to fire down into them as they as they passed. The wash overturned the enemy craft, Ashby turned and ran over any remains. Lt Ron Ashby HKRNVR "At 08.45 on Friday December 19th, 1941, acting on instructions received through you from XDO to Proceed into Harbour & shoot anything inside. On nearing North Point I came under heavy machine-gun fire and this was my first indication that the Japanese had actually landed and established themselves on Hong Kong Island. Got to within one hundred yards before opening fire with all five machine-guns. Tracer showed bullets sprayed target most effectively. A moment or so later, & we ran into a hail of fire from both Kowloon and North Point---rifle, machine-gun, and shell fire, while a plane continually dived down on our stern, spraying us with machine-gun and cannon. The 238th Regiment of the IJA sent 8 craft with outboard motors each towing two collapsible craft with troops lying unmoving in the bottom. They were accompanied by one group of 3 Shohatsu and two groups each consisting of 5 local power craft - probably cross harbour ferries that had been coomandeered..
Lt Ron Ashby HKRNVR " I continued towards Kowloon Bay and sighted numbers of landing craft in threes crossing from East of Holts Warf and making for the area west of Taikoo suger refinery. These landing craft which appeared very frail (probably portable) were in threes towed by the leading boat of each three which had an outboard motor. Each boat contained from 12 to 15 men. I passed down the leading string at a distance of about five yards, firing continuously. The landing craft capsized in my wash and there appeared to be no survivors. Left: Leading Stoker R Barker killed when MTB 07 was straffed accros the stern with cannon fire. 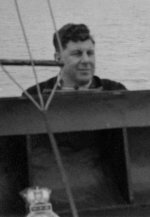 Lt Kennedy RNVR "I could now see that "07" was bearing down on a number of landing craft, and there were more beyond, So the enemy must have landed during the night under cover of the smoke screen from the blazing oil-tanks. Lt Ron Ashby HKRNVR "I ordered the Telegraphist, T.G. Duckworth, to the engine-room to investigate. My speed was reduced to 22 knots. However, I turned and attacked a second bunch of landing craft with machine-gun fire at point-blank range with most satisfactory effect. Another cannon-shell now put my port engine out of action and my Telegraphist was killed by machine-gun fire. Left: Telegraphist Tom Duckworth was killed when MTB 07 was hit by IJA machine-gun fire while administering first aid to L/St Barker. Lt Kennedy RNVR "Speed was reduced to deal with the craft , and it was put out of action by fire from the Lewis-guns, and from a Bren Light Automatic operated by the 1st Lieutenant from the conning-tower with much effect. All our machine-guns were chattering incessantly, and Tommy Brewer, belligerent as ever, kept swinging an automatic rifle over my head in his eagerness not to miss a single target. "For God's sake Tommy," I shouted, "watch what you're doing with that gun. You'll kill someone." When we took stock on the other side of the bay, there was little ammunition left, but by this time all the landing craft had been sunk or driven back to shelter." Lt Ron Ashby HKRNVR "I headed for the Naval Yard under intense machine-gun and howitzer fire and under attack from three aircraft. I directed fire against the diving aircraft and tracers were observed to enter the fuselage of two of them, one of which made off towards Kowloon low down and did not return. Lt Kennedy RNVR "07" seemed to be in trouble. She was making back through the harbour at reduced speed, and we turned after her to run the gauntlet again, zigzagging wildly at full throttle. The firing slackened as we caught up with her, limping on one engine, and when she broke down completely, we took her in tow. Lt Collingwood RN "As we went in, the Japs began to take notice and we met furious fire from the mainland, from Hong Kong Island itself (where the Japs had formed a bridgehead) and also from the Japanese fighters overhead. I started to zigzag violently and kept well in the middle of the bay. 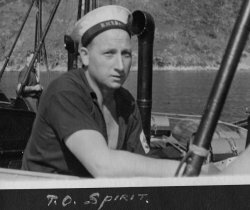 Shortly after the Jap's had opened fire on me we were hit several times, and my cox'n ( PO Robert Spirit) was wounded in the neck. Left: Sub-Lt George Spedding McGill HKRNVR killed when MTB 12 took a direct hit. Sub-Lt Legge HKRNVR "No sooner had we passed the Kowloon point than they let us have it, from both sides field guns at point blank range, machine guns, rifles, and planes dive-bombing and machine gunning and cannoning us. Merry hell was let loose and only our speed and the fact that we were zigzagging wildly all the time saved us. We shot right down the harbor, could see nothing to attack and had to come back the same way. Sub-Lt Legge HKRNVR "On the way back we stopped around the corner to signal to shore not to send any more boats out as there was nothing to attack, and met the next two boats coming out. We were cruising along at about eight knots when the other two boats (26 & 27) started to fire at something. I looked up and the first thing that caught my eye was a bomb no more than fifty yards away coming straight at the boat. Left: Lt John Baxter Colls HKRNVR killed when MTB 12 took a direct hit. 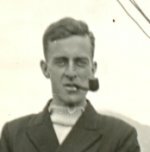 A/B Arthur Bartlett Survived the blast on "12" and managed to swim ashore to Hong Kong Island where he was taken to the Queen Mary hospital suffering immersion. He along with PO Alf Hunt subsequently spent nearly four years as Japanese POW's. Lt Parsons HKRNVR "Upon going alongside HMS Robin MTB's 27 and 26 (8th sub division) were ordered to proceed to Green Island and await further orders from XDO, which would be passed to us through Mt Davis signal station. We proceeded about 09.40 and at about 09.50 when off Mt Davis MTB 11 approached us from Sulphur Channel, and commenced to signal us by Morse. At the same time Mt Davis signal station was calling us up, and ordering us to stay at Green Island. I reduced speed to dead slow in order to receive both these signals; whilst receiving them an enemy was observed making a dive bombing attack on MTB 11, and I opened fire on it. After ceasing fire MTB 26 was observed to increase speed, pass me and enter Sulphur Channel, refusing to answer my signals. After waiting at Green Island for about half an hour I was ordered to return to Aberdeen by XDO, and did so. Left: Lt Donald William Wagstaff HKRNVR killed when MTB 26 was sunk with all hands. Colin McEwan S.O.E. "From our window at the Police HQ we had an excellent view of the M. T.B. raid up the harbour. Although we missed the first pair we suddenly saw one — later found out to be Wagstaff's (MTB 26) — come racing up the harbour from Green Island in a straight line for Kowloon Bay. By this time the Jap's, were on both sides of the harbour and both M. G and T.M. fire were brought to bear on the boat while to add to the strafing she was being bombed at the same time. Lt- Cmdr Gandy RN (Rtrd) "07 & 09 were much fired on by enemy guns, machine-guns, and planes. Commander Hugh Montague RN (Retrd) "The Commodore ordered by signal that all ships except "Cicala" and effective MTB's were to be scuttled. I also ordered Lieutenant Pittendrigh, R.N.R. (1st Lieutenant of the Dockyard) to keep afloat the water boat WAVE, 2 small fuel lighters, and 2 small petrol lighters. During the night of 19th/20th the enemy occupied MOUNT BARKER and penetrated to WONG NEI CHONG GAP. At Aberdeen we were ordered to send every available man to assist the troops in counter-attacks. It was arranged that two platoons of Naval Ratings (mainly from THRACIAN) should join the troops attacking WONG NEI CHONG GAP, while the Dockyard Defense Corps should take over the pill-boxes in DEEPWATER BAY to free troops. The Warrant Officers at the Chung Hom Kok (Chung Am Kok) Mine Control station near Stanley detonated the controlled mines before destroying the station. They then formed into Royal Navy Divisions to assist in the defence of the Repulse Bay Hotel nearby. Bill Wright was captured at the hotel garage but managed to escape. Benny Proulx was within fifteen yards of the Japanese holding the navy prisoners when he and a colleague shot the officer and two of his men before the remainder disappeared into the bushes. Lt-Cmd Gandy RN (Rtrd) "At 13.00 I was ordered to see the 'Extended Defense Officer' (XDO) and Commodore and proceed to headquarters and dockyard on a motorcycle in heavy rain. There was a good deal of shelling on the Hong Kong side but Aberdeen was quiet. I was then given confidential instructions to carry a European guerilla leader, Mr F.W.K. and his two assistants in the boats of the Flotilla and to land him north of Hong Kong after scuttling, and to endeavor to pass through the Japanese lines with flotilla personnel in the event of Flotilla being ordered to leave Hong Kong. If it was not possible to pass through the lines I was to operate as a "guerilla force" against the Japanese in the hope of relief by Chinese forces. Left: Sub Lt Jack Eager HKRNVR killed when MTB 26 was sunk with all hands. The flotilla had taken a beating and was still licking its wounds two days after its epic attack in Victoria Harbour. These highly tuned thoroughbreds had been denied badly needed maintenance during the battle, and were beginning to suffer as a consequence.